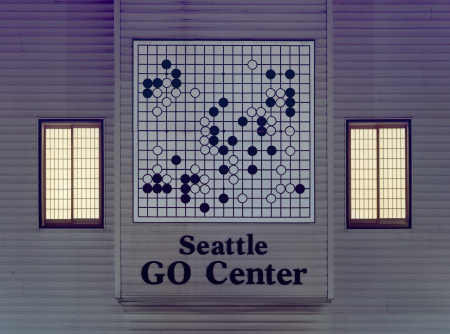 The Seattle Go Center teaches and promotes the Asian game of Go. This 4000 year old strategy board game continues to fascinate players from around the world. The Seattle Go Center was established in 1995, with its own building in the University District of Seattle, thanks to the generosity of a Japanese professional Go player, Iwamoto Kaoru. It is now self-supporting. The Go Center is recognized as a 501(c)(3) public charity, with the formal name of Nihon Ki-in Go Institute of the West. It is organized as nonprofit corporation under the laws of the State of Washington. Featuring a Japanese style tatami room, and a larger American style playing room with display boards for teaching, the Go Center provides a quiet and uncluttered space for studying and playing Go. The Center also has a reference library with books and periodicals in Japanese, English, Chinese, and Korean, filling more than 96 feet of bookshelves. The essential beginner’s books and equipment are also offered for sale. Two public computer stations are set up with a variety of go programs. A digital projector is available for lectures. Members may use the well equipped kitchen to prepare food and hot drinks, and there is an ample refrigerator with cold juice and soda.